I discovered this frog as seen in the first photo, sitting on a rock just underneath the surface and thus partly submerged. It held this position for at least 10 minutes while I returned to camp to fetch my camera, which I foolishly had left behind. After taking a couple of pictures it made a sudden movement and I thought I had scared it off. But it wasn't scared; it was lunging after a water bug snack. Then it swam a foot or so closer to me and posed as in the second photo. 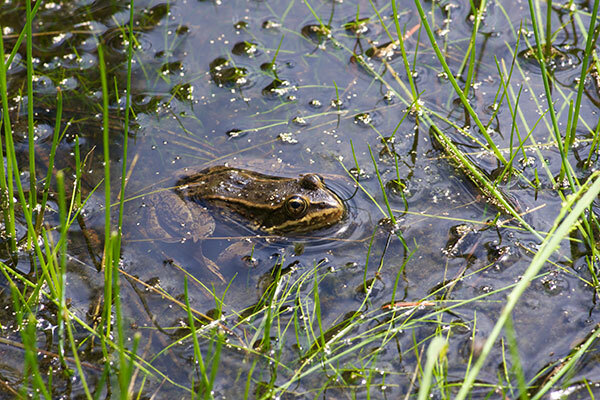 This impressive frog was one of several that I saw along the edge of this small lake near Hyalite reservoir. 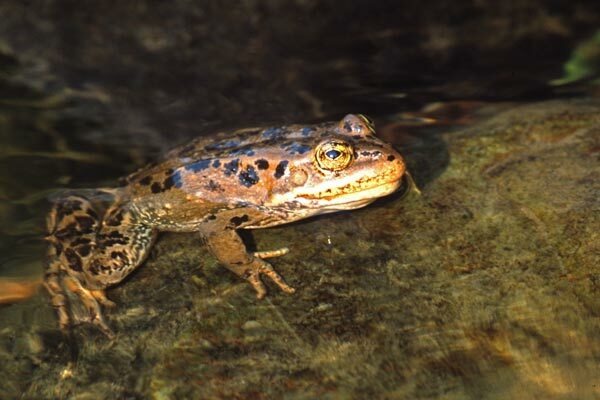 Thanks to Joshua Puhn for convincing me that it was indeed a Columbia Spotted Frog. 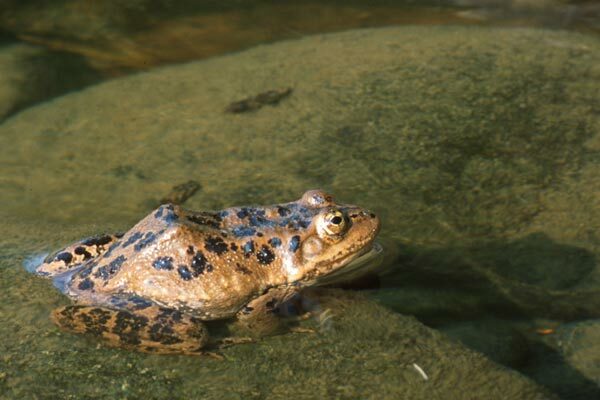 As is the case with many species of aquatic frogs, the trick to getting a photo isn't just to see them, the trick is to see them before they leap into the water and vanish. And then to slowly sneak up close. 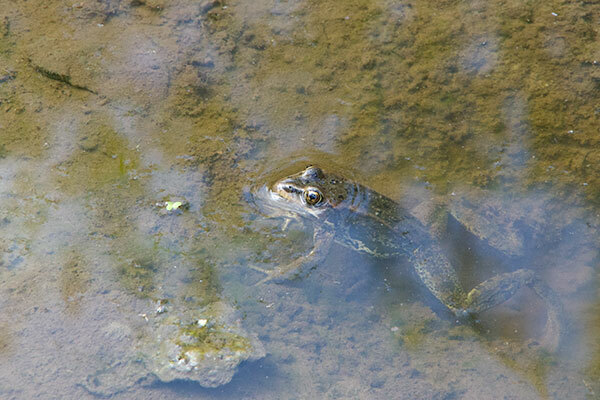 I saw more than a dozen of these frogs around this particular pond, but this was the only one I saw before it moved. My first Canadian herp! 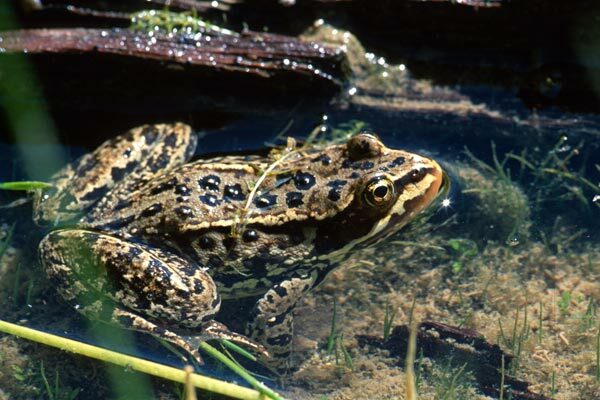 This fine-fettled frog was living in a disgusting cattle-despoiled pond that had flooded across the cattle-despoiled trail. Did I mention the despoiling? And the cattle? My wife and I and our four dogs had to balance-beam our way across a few thin, loose, slippery downed branches in order to continue along the trail and remain un-despoiled ourselves. My wife and I were not happy about the state of this trail (though the dogs did not seem to mind). Then this frog showed up and I was happy again.